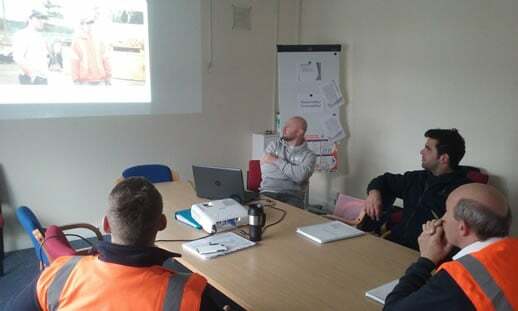 The latest training from Ferryspeed has seen supervisors from the Guernsey depot learn how to identify and reduce hazards in the workplace. Thom Baxter, Ferryspeed’s Quality & Safety Advisor, ran the IOSH (Institution of Occupational Safety and Health) Managing Safely course at the end of last year. The training was provided as part of the Ferryspeed Academy, and it is now a pre-requisite for Ferryspeed’s supervisors. Once the training is complete, they can be called Safety Supervisors. Feedback from those who attended the practical, hands-on course was positive, with comments such as ‘it helped me to understand my responsibilities and accountabilities as a supervisor’. Learning outcomes from the course include assessing, reducing and controlling risk in the workplace; identifying workplace hazards and risks, their impact and how to manage them; and how to evaluate and respond to an incident. Each student completed a risk assessment project, which entailed them to identify hazards in their workplace and devise suitable control measures to reduce or mitigate the risk from these hazards. Thom has delivered the IOSH Managing Safely course three times to date and will provide the training to additional supervisors in the Guernsey and Jersey depots in the coming months. The Managing Safely qualification lasts for three years and then supervisors are required to attend a refresher course. IOSH is one of the largest health and safety membership organisation’s in the world as well as being a chartered body.